Some popular, most of them off-the grid, here is a road trip guide to 9 of the not-to-be missed tourist places near Hyderabad within 200 Kilometres that can be reached in under three and a half hours. Most of them can be done on a day trip from Hyderabad, but these destinations are also ideal for slow travel. So you can choose to linger – at a few if not all – and unravel them over a weekend, at your own leisurely pace. Pillalamarri (Telugu for banyan tree and its children) isn’t just the name of a famous Banyan Tree but of the village – where it stands – itself. This seven hundred year old Giant Banyan Tree spread over four acres of land just outside the city of Mahbubnagar is so popular with tourists, that it now has a deer park and science museum for the children who come there. Getting There | Take the NH44 from Hyderabad, till Jadcherla and from there on head right onto NH167 to get to Pillalamarri, Mahbubnagar. Where to Stay near Pillalmarri | Gadwal Haritha Hotel run by Telangana Tourism. This small village just off the busy Hyderabad – Vijayawada Highway and its popular pit stop destination – Suryapet, doesn’t boast of an olden Giant Banyan Tree like the other eponymous village mentioned previously. And, is not to be confused with that. This Pillalamarri in Nalgonda District, on the other hand, boasts of two ancient temples from the Kakatiya Era. Some say that the beautiful adorned pillars of these Shiva temples have inspired an entire range of traditional jewellery in South India. Getting There | Take the NH65 from Hyderabad and just before Suryapet head left. Use Google Maps to guide you towards Pillala Marri Rural. Warangal is not just the second biggest city in the Telangana today. It is also the state’s most historic, for it was once the capital of the Kakatiyas. Making it a hotspot for heritage lovers. From magnificent medieval temples like the Ramappa Temple to the lyrical Thousand Pillar Temple, this 12th century city is most definitely The Heritage City of Telangana. Also popular here is the Lakanavaram Lake, with its holiday island and the widely recognisable yellow suspension bridge. Getting There | Take the NH163 from Hyderabad to reach Warangal via Bhongir. Where to Stay in Warangal | At the Haritha Kakatiya Hotel, which is probably the best Telangana Tourism run hotel in the State. If one loves visiting places of historic significance and can’t get enough of architecture, Bidar – just across the state border in Karnataka – is one of those road trip destinations from Hyderabad that are not to be missed. Though the most prominent landmark here is the Bidar Fort, there are over sixty listed monuments here, in this little town. The other often frequented tourist place here is the Guru Nanak Jhira Sahib Gurudwara. People of all faiths come here, even straight from the Hyderabad airport just to get water from the holy spring that is said to possess healing powers. Getting There | From Hyderabad take the ORR and then the NH65 till Zaheerabad From there head right to get to Bidar. Best Time to Visit | July – October. Monsoon is when the flood gates open. The Nagarjuna Sagar Dam in Nalgonda district holds the record for being India’s tallest masonry dam. Almost fifty years old, this dam which took twelves years to finish, is still considered to be one of the largest dams built in Asia in the recent times. It is quite the sight when its twenty six flood gates are open and the water gushes down in powerful streams. Getting There | Take the ‘Sagar Road‘ from Hyderabad to reach Nagarjuna Sagar via Devarakonda. Where to Stay in Nagarjuna Sagar | The Haritha Vijay Vihar Hotel run by Telangana Tourism. It offers beautiful views of the lake. Best Time to Visit | July – September. Monsoon for the dramatic clouds. Undoubtedly Telangana’s most striking fort, Elgandal Fort makes Karimnagar, the state’s most underrated tourist destination. Little known and too far from Hyderabad, Karimnagar is peppered with quite a few other forts, ancient temple ruins and Buddhist sites. This is the one road trip on the list here that promises a packed weekend! You can also hear me talking about my road trip to Karimnagar for The Musafir Stories, here. Getting There | Take the Hyderabad – Ramagundam Road or the NH163 to reach Karimnagar via Siddipet. Alternatively, you can also take the NH44 from Hyderabad and go right from Kamareddy. Where to Stay in Karimnagar | Haritha Hotel Kondagattu run by Telangana Tourism. Best Time to Visit | July – September. For the rain washed landscape. An ancient temple that is a Ramayana place, where Lord Rama is believed to have stopped – during the course of the Ramayana. Lakes both expansive and small, nestled between hills or sitting serenely behind boulders. Extensive gravity defying rock formations with hidden cave temples inside. All of these and more make Nizamabad truly an explorer’s delight. 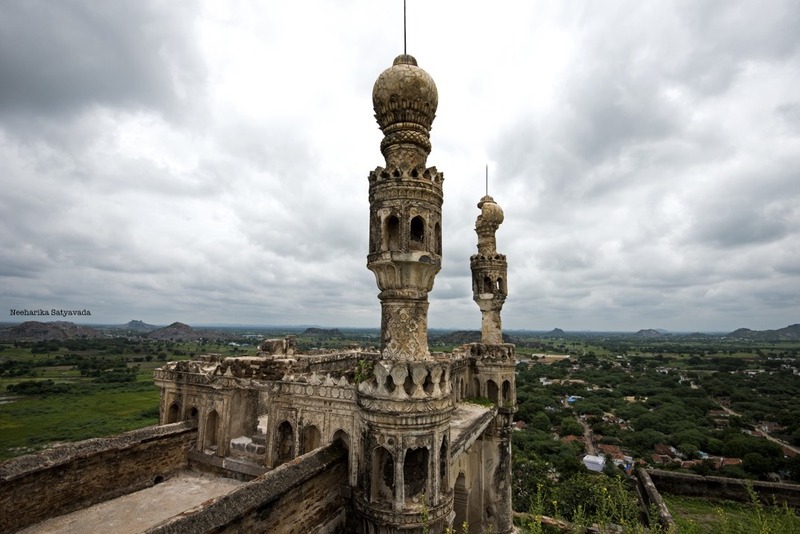 It cannot get more offbeat than this if you are looking for a quick road trip from Hyderabad. Getting There | Take the NH44 from Hyderabad straight to Nizamabad. Where to Stay in Nizamabad | Haritha Indur Inn in Nizamabad City, run by Telangana Tourism. Jetprole, Kollapur and Somasila are small villages within minutes of each other along the left bank of the River Krishna. These little hamlets are significant in that, here is where all the ancient temples that were in danger of being submerged – when the Srisailam Dam was being built – were brought to and put back together stone for stone as they were originally. Somasila is also with popular with nature lovers for the scenic river bed is just ideal for a restful camping experience. Getting There | Take the NH765 from Hyderabad straight to Somasila. Or take the NH44 to Pebbair and then go left towards Kollapur. Suggested Itinerary | Do the Alampur – Jetprole – Kollapur – Somasila – Gadwal circuit over a long weekend of temple hopping, ending with a quick spot of shopping for handlooms. Where to Stay in Jetprole | Recently inaugurated Haritha Hotel Jetprole, run by Telangana Tourism. From prehistoric rock paintings to historic temples from the era of the Kakatiyas – who built many temples in the region dedicated to the Lord Shiva, Khammam does have a few destinations that make a road trip to Khammam worth it. The two twelfth century temples in Kusumanchi are just as exquisite in their architecture as other better known Kakatiya temples like the Ramappa Temple and the ones in Ghanpur. It was also here in Khammam, in Nelakondapalli that numerous Buddhist antiquities and even coins dating as far back as to the Ikshvakus were unearthed. And, the Stupa that still stoically stands here is the testimony to this region’s erstwhile significance. Getting There | Take the NH65 from Hyderabad to Suryapet and then head left to Khammam. Wow. Just came across your blog and it’s amazing. Bookmarking it. Khammam ancient rock painting style sound really interesting.